Olallie Lake needed a from me today, and the morning sun was too good to refuse. After yesterday’s 10-miler to Kelcema Lake, I almost didn’t get out this morning. Weather turned for the better to my surprise, even with the horrible forecast we’ve been getting. It was 11:30 when I got to the trailhead and started hiking at a quarter til. For those who aren’t familiar, the hike to Olallie and Talapus lakes can also be reached through the Granite Mountain/Pratt Lake trailhead at exit 47 just to the north off the freeway. This route adds an additional mile to the hike, making it six miles round-trip. The Exit 45 trailhead requires additional three-mile drive to the end of NFD Road 9030, which is usually closed in the winter due to road conditions. This route in wintertime would make an eight-mile hike round-trip, so it’s better off taking the six-mile route due to shorter daylight this time of the year. The trail was in great conditions despite of the amount of snow. By the time I started hiking, there had already been enough traffic on the trail to pack the snow down. The party I met on the way in turned around at the Alpine Lakes Wilderness sign about two miles in. 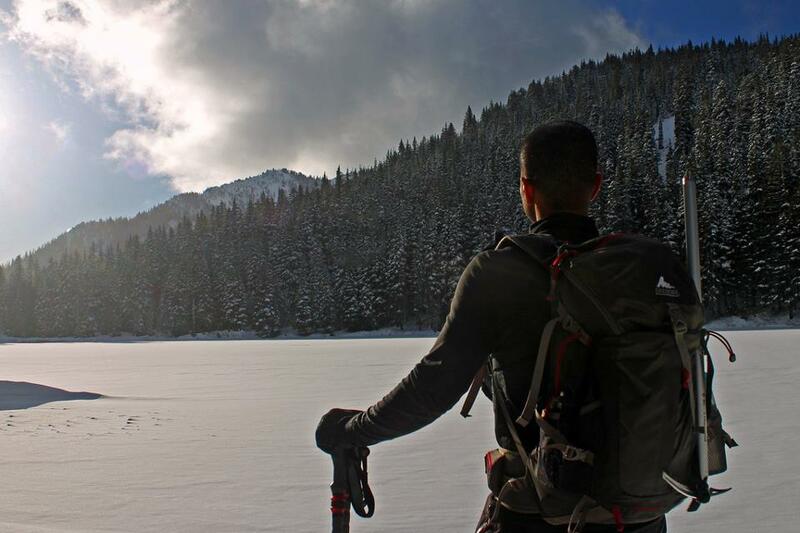 From there I broke trail in boots in two feet of snow, past the Talapus/Olallie Lake trail junction at 2.5 miles and to the turn-off down to Olallie Lake half a mile beyond the junction. Unable to see the trail at the turn-off, I put on snowshoes and traversed westerly to drop 100 feet down to the lake. The clouds were slowly dissipating and the sun was shinning brightly. I got to the lake at 2 PM, in time for great photo opps in the gorgeous afternoon weather. I stayed half hour savoring the views and befriending a few Gray Jays chirping on nearby tree branches. Got back to the car at exactly 4 PM, 20 minutes before sunset.